Home » Entertainment » 4th PMAP Makatao Awards: Vote Now! 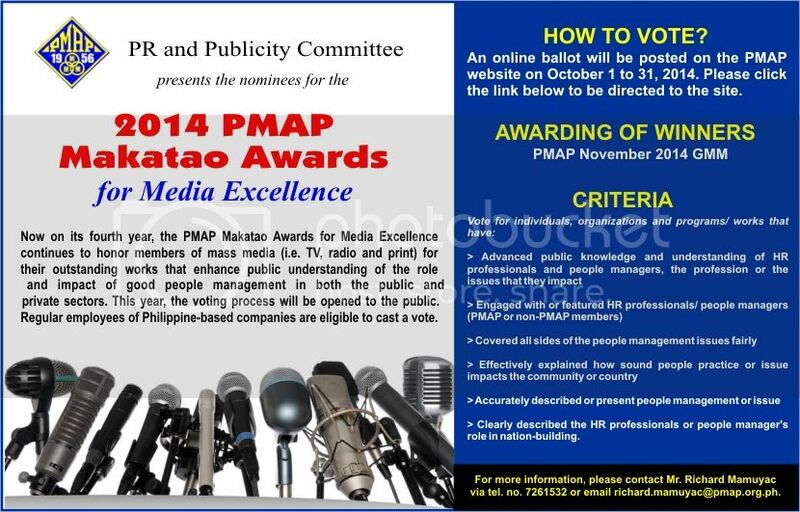 4th PMAP Makatao Awards: Vote Now! The PMAP Makatao Awards for Media Excellence continues to honor members of mass media (i.e. TV, radio and print) for their outstanding works that enhance public understanding of the role and impact of good people management in both the public and private sectors. This year, the voting process will be opened to the public. Regular employees of Philippine-based companies are eligible to cast a vote. ABOUT PMAP: The People Management Association of the Philippines (PMAP) is strictly a professional, non-stock, not-for-profit organization of over 1,800 member companies and individual management executives engaged or interested in Human Resource Management (HRM) and Industrial Relations (IR) work. Founded more than 56 years ago, PMAP continue the tradition of its forefathers in advancing the profession, the science, and the art of Human Resource Management. As a professional association, PMAP helps institutions mold an enlightened, competent, socially responsible, and influential sector of people managers who can effectively participate in nation-building. PMAP also helps its members become more effective on the job by teaching the human aspect of management via numerous career development forums and training programs.